This body camera is manufactured and sold by many Chinese companies. In the USA it is most popular as the Bodycam brand body camera by Provision. This body camera is one of the smaller ones on the market. The light weight and small size also means shorter battery life of 2.4-4 hours (depending on quality). The camera can be attached to an external battery pack to extend the battery life to 10 hours. We rate this body camera 3 stars because of its smaller size, secure mounting bracket and ease of use. This camera has a fixed static lens, limiting its mounting options and recording angles. (Officers with taller stature or bigger chest, risk ending up pointing to the sky). This body camera is smaller than average, weighing 4.8 ounces. However, there is a noticeable pull on shirt or uniform. The body camera comes with 2 different mounting brackets. One bracket has a strong rotatable 2.5″ alligator style clip with teeth for a strong grip on a shirt or uniform. The hinge is very strong and seems like it will last long against average use and offers a solid grip on the camera. This body camera’s clip is non-adjustable; the “hinge” style connection is close to the camera, giving no room for pivoting the camera for better video angle. The second mounting bracket has a 3″ alligator style clip for epaulet mounting. The clip has a hinge for angling the camera, however the hinge is extremely weak and does not lock into place very well, any motion can easily knock it out of place. The body camera gives a quick beep when turned on and off and when it starts and ends recording. The camera’s status light is illuminated red when on and blinks green when recording, however it is discreetly hidden at an angle that can only be seen by the officer. This body camera has a 2.4 to 4 hour battery life (depending on video quality settings). An optional external battery pack can supply 10 hours of battery life. To activate the body camera, you must press and hold the power button for about 5 seconds. This body camera does not offer true one touch recording. The body camera must first be powered on before the recording button can be pressed. Also there are separate buttons for start recording and stop recording. The buttons beep loudly when pressed. The body camera operates by buttons only (no switches). With body cameras, we always recommend switches over buttons because it is always possible for an officer to forget they pressed the button; with switches, the officer can quickly visually and physically feel that the switch is up or down; turned on or off to confirm it is active and working. There are 8 buttons on this body camera, they beep when pressed, but the beeping can be turned off. The body camera has a 1.5″ playback screen on the back. It is possible to turn the screen off. It is possible to configure settings using the playback screen, but it is difficult to navigate and use. The body camera’s casing is made of plastic. This body camera has a Waterproof rating of IP65. The top video quality is 1920p but the 170-degree field of view gives the video a distorted “fish eye” look. The body camera has Infrared night vision that can be activated with the flip of a switch on the front of the camera. 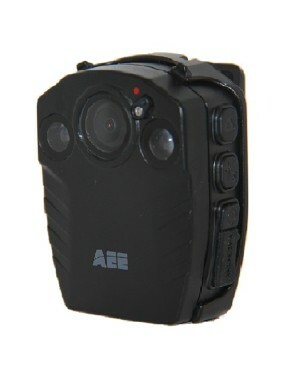 Unique features about this camera include wireless remote control, which is illogical considering the concept of the body camera is to be mounted on a person’s body and easily accessible within reach to activate. The body camera offers still picture, audio only and video recording functions. The camera has no radio interface, GPS or Pre-Record capability.